The offer presented below is time limited marketing test. The theoretical assumptions of such tests should be carried out only fictitiously. For the sake of the trust of our customers, we will proceed all orders. By clicking the "Order Now" you are going to buy download version of 4mind SPEED READING software. A few minutes after we receive your payment – we will send you an email with the license key (ProductID) and download link. If you want a boxed version of the software - please mark the checkbox below. I want to pay extra shipping costs and get a boxed version of the software. Waiting time is usually 10-14 days. I am convinced that everyone wants to read faster. 4mind SPEED READING is designed to help you regardless of whether you are a student, manager, or you want to achieve another difficult goal. Mastering the techniques of speed reading will help you to efficiently acquire knowledge in the self-improvement and business purposes. What is important – you will not lose the pleasure of reading! The same techniques can be successfully used for reading your favorite novels. Polish edition of 4mind SPEED READING won the "Best educational software of the year" title in CHIP Magazine. 4mind SPEED READING software was delivered to more than 150 thousand people. Our research shows that the average reading speed is between 180 to 220 words per minute. With the right training, each person is able to read 2 to 5 times faster. But be aware that speed reading is not a set of magical spells. Speed reading is a difficult, but interesting training, which will bring you much satisfaction. When we learned to read we were told to read the letters submitted, so that in our mind, the word appeared. Then the advice was to read whole words. One of the main objectives of speed reading is to go a step further - 4mind SPEED READING will teach you to read groups of words instead of single words. The vast majority of people speak in their minds what they read. This process is called subvocalization. 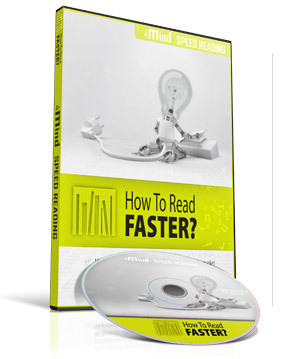 4mind SPEED READING will teach how to eliminate this habit in order to read faster. Regression means frequent stoppages and returns to the sentences read previously. When you read faster your mind is able to better concentrate on the text. The course begins with a test of speed reading and comprehension. Thanks to regular evaluations you will be able to monitor the progress being made. 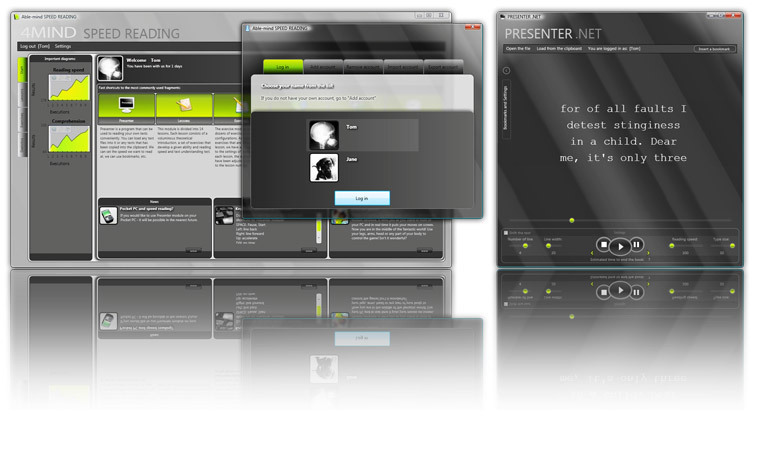 PRESENTER is one of the most important modules of 4mind SPEED READING. It allows you to comfortably read any texts - books, articles, websites and any text copied to the clipboard. We can set both the pattern and the SPEED of the text projection for ourselves. The program has been designed to force the reading process to be in accordance with all the assumptions of speed reading technics. Besides the lessons - you will find training modules focused on specific skills. We have here a "Memory training", "Gymnastics of the eye," "Field of vision" and "Drill". Each training module contains a carefully chosen set of exercises that will allow you to successfully practice the things that make you the most difficulty. Use of knowledge gained through life! We can NOT promise you that in 10 days you will read 10 times faster. However we CAN guarantee that you will learn effective techniques of reading that will serve you until the end of life. Try to move at a rate of 2 or 3 lessons a week. However - try to practice every day, use the additional modules (Memory training, Field of vision, etc.). What does 4mind SPEED READING look like? What exactly do I buy?